Instantly view stats across multiple ad groups and campaigns. See how lines performed independantly or together. 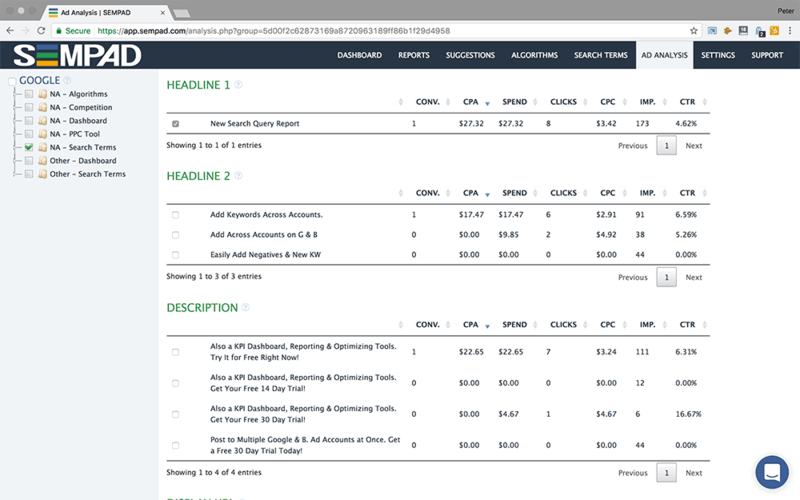 Never use spreadsheets or filters to analyze your ad copy again! With SEMPAD's Ad Analysis tool it's easy to see how different ad copy performed for any date range, across multiple campaigns and ad groups. Make informed decisions with more data! Select any row (headline 1, description, etc.) and SEMPAD will narrow it down to only the ad copy and stats which included that row. TRY OUR AD ANALYSIS & OTHER TOOLS FREE!